Surat Police Commissioner Satish Sharma said the situation was under control and the police were trying to ascertain who were behind the violence. The mobs also burnt tyres on roads and indulged in stone pelting. 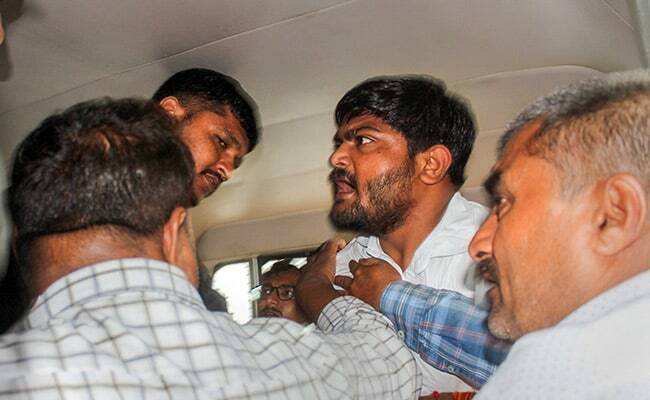 Tension gripped Gujarat city with mobs setting ablaze a BRTS bus and vandalising a bus stand tonight, apparently in protest against the arrest of Patidar quota agitation leader Alpesh Kathiriya, a close aide of Hardik Patel, by the Ahmedabad Crime Branch in an old sedition case. The bus was set on fire in the Yogi Chowk area and the bus stand in the Varachha area. Mr Kathiriya is a leader of the Patidar Anamat Andolan Samiti (PAAS), an outfit organising protests demanding reservation for the Patidar community. He was arrested by the Crime Branch in Ahmedabad when he was on his way to stage a symbolic fast. "A BRTS bus was set ablaze and a bus stand damaged by mobs, but we have brought the situation under control. We are trying to ascertain who all were behind the violence. It appears that those behind the violence are PAAS members and those sympathising with the outfit," he said. Mr Sharma added that patrolling was intensified since evening, anticipating violence, after Mr Kathiriya, who is from Surat, was arrested by the Ahmedabad Crime Branch in an old sedition case. Mr Kathiriya was detained, along with Patel, who is spearheading the protest demanding reservation for the Patidar community, and seven others by the Ahmedabad Crime Branch this morning when they were on their way to a protest site to observe a symbolic fast. While eight of them were released on bail after being booked under sections 143 (punishment for unlawful assembly) and 186 (obstructing public servant in discharge of public functions) of the IPC, Kathiriya was shown as arrested in a sedition case dating back to 2015, in which he was an accused, a Crime Branch official said. This had apparently irked the PAAS members and sympathisers, who indulged in violence, Mr Sharma said. Meanwhile, Mr Patel released a video clip, appealing for peace. "I request the people to maintain peace and not destroy public property. Whatever the police did was not right, but what is being done now is also not right. Protest, but peacefully and constitutionally, not by destroying government property. I appeal for peace," he said in the clip.